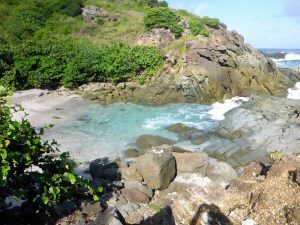 The Bubbly Pools on the east end of Jost Van Dyke is a must see. A short walk from Foxy’s Taboo, it is well worth the short hike. 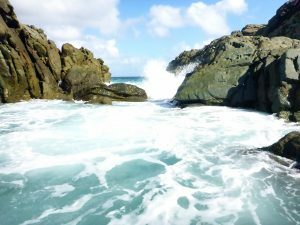 The north swells rush in between natural rock walls and creates a huge rush of bubbly water into a large pool on the beach! You have got to experience this, it’s so beautiful! View of waves coming over rocks at Bubbly Pools. A view of Bubbly Pools from the rocks above. 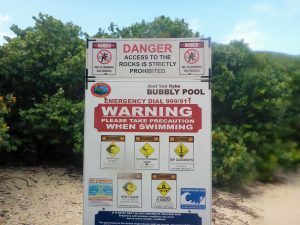 Warning sign at Bubbyly Pools.